Assessing and Treating Pediatric Obesity in Neurodevelopmental Disorders Cadieux Adelle M.
Add to cart the imprimé à la demande of Cadieux Adelle M.
This book reviews strategies for assessing and treating pediatric obesity in children with neurodevelopmental disorders (ND). It synthesizes empirical findings and clinical strategies to offer the latest knowledge in key areas, including risk factors, physical activity, nutrition, treatment planning, goal-setting, and engagement with patients. A four-stage treatment model presents clinical guidance in triaging treatment and tailoring interventions to children?s changing medical, behavioral, emotional, and cognitive needs. The book complements current pediatric ND literature by presenting clear guidelines for integrating treatment for obesity into existing treatment of these young patients. 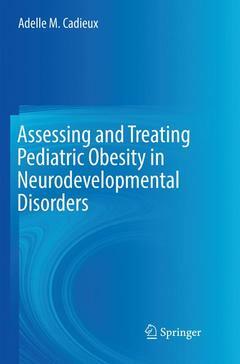 The effect of neurodevelopmental disorders on the assessment of obesity in children. The impact of developmental delays on physical activities and health behaviors. Strategies for promoting weight management goals in pediatric ND. Suggestions on how to engage and support families and caregivers. The role of prevention in weight management within pediatric ND. Assessing and Treating Pediatric Obesity in Neurodevelopmental Disorders is a must-have resource for clinicians, scientist-practitioners, and related professionals as well as researchers, professors, and graduate students in clinical child and school psychology, public health, social work, pediatrics, occupational therapy, and nutrition. 1. Introduction: Purpose and Prevalence.- Chapter 2. Growth and Development.- Chapter 3. Social, Emotional, and Behavior Functioning.- Chapter 4. Physical Activity and Sedentary Behavior.- Chapter 5. Nutrition.- Chapter 6. Medical Comorbidities.- Chapter 7. Family Functioning.- Chapter 8. Developing a Comprehensive Treatment Approach.- Chapter 9. Building Prevention into Healthcare Services.- Chapter 10. Developing a Comprehensive Treatment Program. Adelle M. Cadieux, Psy.D., is a pediatric psychologist at Helen DeVos Children’s Hospital in Grand Rapids, MI and Clinical Assistant Professor for Michigan State University. She has developed a specialized treatment program to address the needs of children with neurodevelopmental disorders who are struggling with obesity at the Helen DeVos Children’s Hospital Healthy Weight Center. As a Clinical Assistant Professor she has assisted in the training of medical residents at the Healthy Weight Center and help promote medical student and resident research in pediatric obesity. She has authored and co-authored multiple articles, and provided presentations and workshops at Society for Pediatric Psychology Annual Conferences, the Society for Developmental and Behavioral Pediatrics Annual Meeting and at American Psychological Association Annual Convention in the area of general pediatric obesity and in the area of pediatric obesity in youth with neurodevelopmental disorders. In the Society of Pediatric Obesity (Division 54 of the American Psychological Association), Dr. Cadieux is the chair of the Pediatric Obesity Special Interest Group. Dr. Cadieux has also participated in the Children’s Hospital Association’s FOCUS on a Fitter Future task force, leading several projects for this national group and continues to collaborate with the ongoing projects that have stemmed from this collaborative task force.